Need More Clients To Grow Your Business or Practice? I work with small businesses and professional practice owners who want effective marketing strategies that win more clients and grow their businesses. They understand that no matter how good their products and services are, marketing is critical to attracting a steady stream of new enquiries, leads, meetings, new clients, increased sales and Income. But often they don’t know where to start or what to do. And with so many ways to go to market it’s difficult to understand which strategies are the best ones for your business. It’s no wonder that marketing remains a frustrating struggle. My focus is working with ambitious people - small business owners, to help them get more clients and to be better at sales and marketing so that they can grow much faster and to avoid the expensive, time wasting mistakes of trying to work it out for themselves. Just to let you know that I’ve been in your situation. Having left the corporate world and starting my own business, I know firsthand how difficult it is to grow a business from scratch. But there are straight forward and very effective ways to market your services that attract more clients day in and day out. These are the proven, tried and tested marketing strategies that I teach my private clients. Browse the site – there are articles, blog posts and free resources that you can work with and that will help you get to grips with finding more clients. Ford gives me invaluable independent business advice based on first hand, practical business experience. He presents clear marketing strategies to drive my business forward, supporting existing customers and seeking new customers. Working with Ford my company has doubled its turnover in 2 years. Have you put time and effort into marketing and finding more clients but it's not working? Are you fed up with disappointing results and unsure how to fix your marketing and grow your business? Are you an independent business owner, keen to grow but find that marketing is a challenge? Do you need a step by step marketing action plan that generates leads, enquiries, and more paying clients? Are you an ambitious business owner that wants to do better? Maybe your business has plateaued or is just ticking over, and you're in need of a structured marketing plan to increase sale and your income. Marketing and finding clients for a professional firm or practice can be tough, particularly if you're struggling to turn skills, knowledge and expertise into services that clients want to buy. 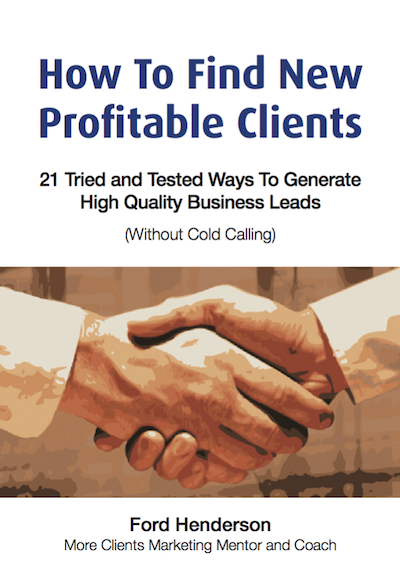 As well as receiving my free marketing book I would like to organise an email copy of my monthly how to get more clients hints, tips and business growth strategies that will help you improve your marketing, attract more profitable clients, and grow your business. So, I need to ask you for permission to keep in touch and to receive my blog posts, articles and business growth month emails. When you complete the form below we will send you a confirmation email to check we have the correct email for you. ​Your details will never be shared.